This Table-Top Cotton Candy Machine will produce up to 60 cones per hour. The heating element gets to flossing temperature in just seconds allowing for “on demand” operation making it ideal for environments that make only one cone at a time. The simple two-switch system allows for easy operation. 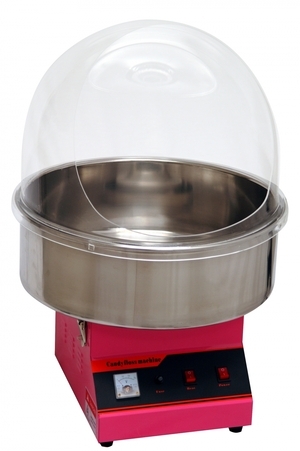 The rental comes complete with the stainless steel bowl and acrylic dome which can be taken apart for easier transport. The machine weighs about 21 pounds and it is about 18x12 inches at the base. You will get the machine clean, and you can return it unwashed after usage. You will be responsible for picking it up and dropping it off. 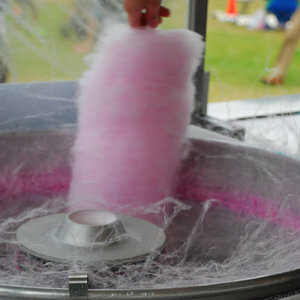 If you are interested, we can sell you the floss sugar (regular or organic) and cones which will give you everything to begin right away. Great for parties and fundraisers.